We’d love your help. Let us know what’s wrong with this preview of Out! 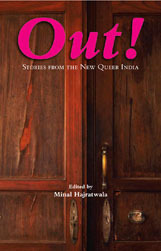 Stories From The New Queer India by Minal Hajratwala. In Bengalaru, a law student falls in love as the nation’s highest courts decide whether his love is legitimate. In Mumbai, a film star and a parent discuss their own journeys of "coming out" as advocates of the lesbian, gay, bisexual, and transgender movement. In rural Kerala, two girls row a small boat and feel their hearts opening. These are the lives of queer Indians tod In Bengalaru, a law student falls in love as the nation’s highest courts decide whether his love is legitimate. In Mumbai, a film star and a parent discuss their own journeys of "coming out" as advocates of the lesbian, gay, bisexual, and transgender movement. In rural Kerala, two girls row a small boat and feel their hearts opening. To ask other readers questions about Out! Stories From The New Queer India, please sign up. Can't believe there is so much of LGBT culture in India! Happy to see them coming out with their stories, many of which are touching and heartfelt, but written in an amateurish way! Good attempt to bring LGBT issues to the frontline! My fellow Hedgebrook alumna edited this book.